Body odor is caused in part by bacteria growth. When you become overheated, your body produces sweat from glands called apocrine glands. Sweat that is not washed away within a few hours can begin to grow bacteria, according to "The Green Pharmacy Herbal Handbook." The bacteria begins to smell, and you have body odor. Conventional deodorants and antiperspirants can fight and prevent body odor. Herbs that contain anti-bacterial properties may be able to eliminate body odor as well, by preventing bacterial growth in the first place. Always check with your doctor before you take any herbal supplement, as not every herb is safe for everyone. 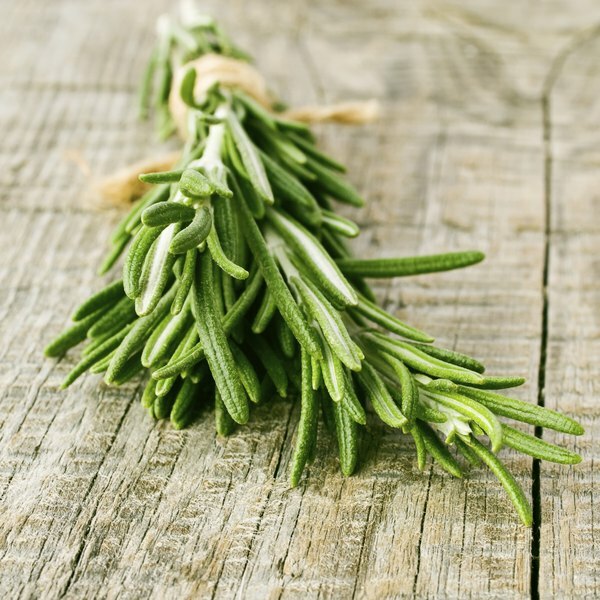 Rosemary is an herb used in Italian cooking, but can also be used to remedy a variety of ailments, according to the University of Maryland Medical Center. The herb is traditionally used to alleviate indigestion and to reduce the incidence of muscle and joint pain, due to its antioxidant components. UMMC reports that rosemary has shown evidence that it can destroy bacteria and fungi in lab tests. The odor-fighting properties of rosemary are most likely stronger when used topically. After gaining the "go ahead" from your physician, you can add rosemary water to your bath to prevent and kill unpleasant odors. Steep about 1/2 cup of dried rosemary leaves in 4 cups of tap water and add to your bath. Oregano is another Mediterranean cooking herb that can be used as a medicinal, according to CAMonline, a service of the National Center for Complementary and Alternative Medicine. CAMonline&#039;s preliminary research shows that the herb may have anti-fungal and anti-bacterial properties, which would be an ideal natural treatment for body odor. As with rosemary, a strong liquid of steeped oregano can be added to your bathwater to eliminate the pungency of your sweat glands. Oregano has the potential to interact with blood-thinning drugs and can cause your blood sugar levels to fluctuate; use caution. Cinnamon, ginger, cloves and nutmeg are all spices you might be accustomed to using in the kitchen, but under your doctor&#039;s supervision, you may also be able to hold off body odor with these baking herbs. "The Green Pharmacy Herbal Handbook" explains that all of these powdered herbs contain substances that are antibacterial in nature and might help slow the development of odor-causing bacteria. Mix a small amount of any of these herbs with baking soda, cornstarch or baby powder and apply to your underarms. Essential oils that are derived from herbs like lavender, sage, oregano or rosemary might eliminate body odor when applied sparingly to your underarms or your pulse points. The antibacterial action of the herbs, as well as the pleasing aroma, can counteract the production of bacteria. Essential oils can be very volatile, which means they can irritate your skin. Diluting the herbal oils with vegetable oils renders them less irritating without compromising their effectiveness. Check with your medical care provider before using essential oils as a natural deodorant to be sure that each individual herb is safe for preexisting medical conditions you might have.